I want you to take out your calculator. Using only the digits 1 through 9, there are three rows, three columns, and two diagonals. I want you to pick either a row, a column, or a diagonal. Then I want you to enter a three digit number using those numbers. For example, if you chose the first row, you can enter 123 or 312 or 231 or any three-digit number using each digit once. Now, I want you to multiply this number by another three-digit number. So hit the times button. Now, choose another row, column, or diagonal and type in another three-digit number, using each of the three digits once. 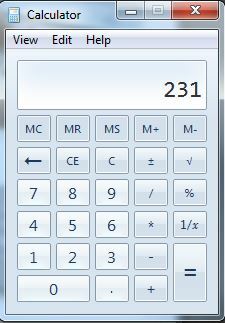 Now hit the equals button to multiply those two numbers together. Is everyone done? The product you just computed should have either five or six digits. I want you to concentrate on one of those digits. Just make sure that you concentrate on a digit other than zero, because zero is boring. So concentrate on a nonzero digit. (I point to someone.) Without telling me the digit you chose, please tell me the other digits in your product. And then I’ll repeat this a few times, and everyone’s amazed that I knew the different numbers that were chosen. Clearly this works using the same logic as yesterday’s post: the product is always a multiple of 9, and so I can add the digits to figure out the missing digit. The more interesting question is: Why is the product always a multiple of 9? I’ll address this in tomorrow’s post.